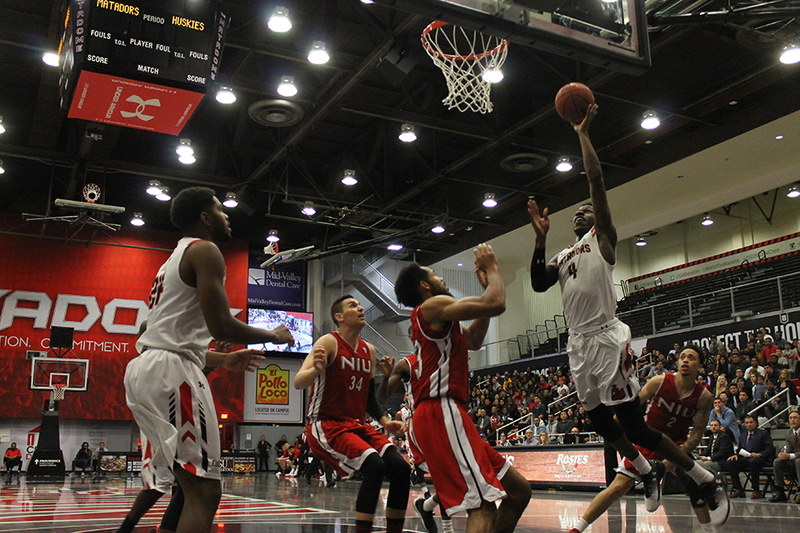 Tensions were high and the crowd’s screams were deafening as California State University, Northridge men’s basketball pulled out a win at home over the Northern Illinois University Huskies on Saturday night, Nov. 19, handing the visitors their first loss of the season. 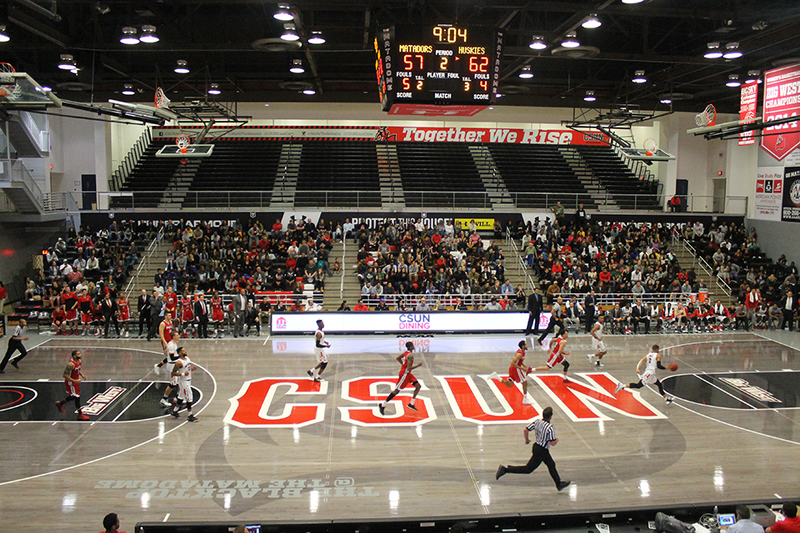 Hundreds of fans showed up to support the Matadors at the second home game of the season, which was also Spirit Night at the Matadome. Fans received free Matador-themed “rally towels” as they walked in, and Matty the Matador threw T-shirts, mini beach balls and other giveaways into the stands throughout the game, hyping up the crowd. There was a VIP lounge set up at the CSUN Athletics building adjacent to the Matadome before the game, where Athletics donors could relax and enjoy complimentary beverages while waiting for the game to start. Fans also enjoyed Menchie’s frozen yogurt and other snacks at the concession stand in the Matadome lobby. The CSUN Band opened the evening with the National Anthem, followed by a video montage of the Matador players. The video amped up the players and the crowd, and CSUN’s cheer and dance teams formed a tunnel for the players to run through before the game began. Younger fans seemed to enjoy the music that the DJ played, dancing and singing along. Although the offense lagged through the first 10 to 12 minutes of the game, they woke up midway through the first half — and so did the fans. After Coach Reggie Theus called a timeout toward the beginning of the first half, the Matadors, led by star player and Senior Guard Aaron Parks, came back into the game energized and ready to play aggressively. Fans roared as the first half of the game came to a close, with the Huskies leading the Matadors 36-34. The halftime show featured performances from the CSUN cheer team and dance team, and young members of the crowd played a game of musical chairs. The Huskies and the Matadors were tied seven times during the physically intense game, and fans remained on the edge of their seats throughout. The energy in the Matadome was high as fans screamed, rooting the Matadors on as they clung to the lead with seconds left in the game. Although both teams battled, the CSUN Matadors edged out the Huskies toward the end of the second half, beating them 84-82 and handing them their first loss of the season.